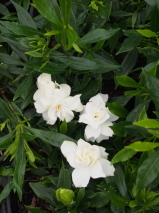 Small shrub with bright green glossy leaves and a low mounding habit. 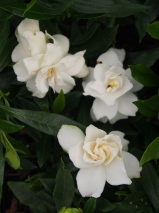 In the warms months it is covered with small richly fragrant ivory cream flowers. It grows best in rich well composted acidic soil. Keep well fed and watered, protect from frost. Trim to maintain shape.